Anything that flew or crawled was always a source of fascination for me. Things had to have a name, and as a child my reading matter of choice had many big pictures of animals, birds and insects. One time I was extremely embarrassed by Peter, a kid who lived across the street. After I told him that deer lost their horns every year he said “Deer don’t have horns, they have antlers!” That was a crushing blow to my self esteem—the pain lingers even now. It is hard to remember how I developed a passion for birds. Perhaps it is the freedom that they enjoy over us earthbound creatures. Of course, their beauty, color, variety, and their accessibility make them fun to study. Listing birds is somewhat analogous to collecting stamps, satisfying some atavistic hunting instinct. The quest for new species adds adventure to any trip, no matter what the purpose, and also causes one to visit some unusual places. Swamps, landfills and sewage treatment facilities rank high on birders’ “must see” locations. Nowadays I see my grandchildren naming the various species of dinosaur just as I learned to name the birds. While knowing the names of birds provides intellectual satisfaction, it also excites greater curiosity about similarities and differences between the kinds of birds, not only in their color, size and shape, but also in their habits, manner of flying, their habitats, patterns of coming and going, and the marvels of their survival. My maternal grandmother, “Sweetheart,” (I gave Ella that name because that is what she always called me) probably instilled some interest by throwing bread out for the “chippies,” as she called the English Sparrows (their proper name in those days). Then there was “Jenny” the wren who occupied one of the bird houses on the trellis. I do not know how Sweetheart came by that name, but later I found a wren named Jenny in one of Thornton Burgess’s Bedtime Stories books.. I collected bird pictures from Arm & Hammer Baking Soda boxes. My first “real” bird book was a small format book by Chester A. Reed, Land Birds East of the Rockies (Doubleday, Page & Company, 1923). There was a picture of a different bird on each page with descriptive text next to it. As I identified each bird in the book, I penciled across its picture in big block letters: “SAW.” That book was assigned to the trash heap long ago, but I recently found another copy. Another book that I really enjoyed was Birds of the South, (by Charlotte Hilton Green, published by UNC Press in 1933, a year before Roger Tory Peterson’s first Field Guide) which was given to me by Lou Fink, a family friend and scout leader who authored a bird watching column in the local newspaper, The Rutherford Republican. Its end papers sport some of my drawings, including a Star-nosed Mole and a deer, and show my address as 164 Springfield and telephone number “Rutherford-2-7392-M,” indicating that I was less than 8 years old when I defaced it. I did continue to use it, checking off the table of contents for each species seen. I remember longing to see a Mockingbird, unknown in the northeastern states at that time. Mockingbirds would later expand their range and become quite common even up into New England. 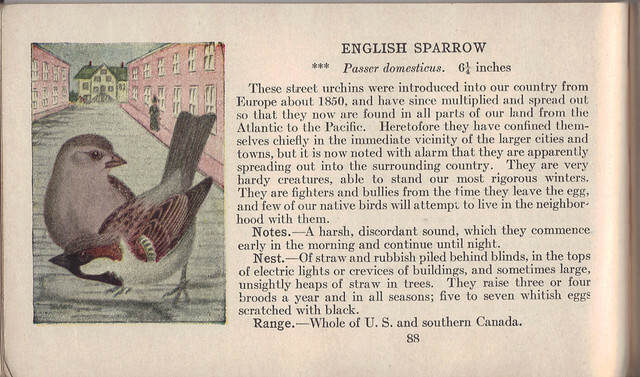 Birds of the South included a table on which the reader could enter bird sightings. I entered only one: “English Sparrow, August 29, in the garden eating weed seeds.” I did not keep a more serious list until I was 13 years old and in pursuit of a Boy Scout merit badge. This list began in the dead of winter, 1948, and reflected a zeal for observing and recording that has continued unabated for nearly 60 years to a present total of 564 US and Canadian species, plus a couple hundred more seen on my few trips to Hawaii and Latin America. I still have my copy of the 1933 first edition of Roger Tory Peterson’s classic, A Field Guide to the Birds, which Mom bought second hand for $2.75. This book, and its many later editions, revolutionized the study of birds by allowing the observer to separate them in the field rather than in the hand. Opera glasses and binoculars replaced the gun barrel for bird study. August 10th, 2008 at 12:52 pm That is so great that you still have the first edition copy of Roger Tory Peterson’s Guide! What a great post, I am glad you linked to it on flickr so we could find it. Wonderful memories!